NSAIDs are one of the most prescribed drugs worldwide. You will get definitely fair amount of questions for this section in the GPAT. 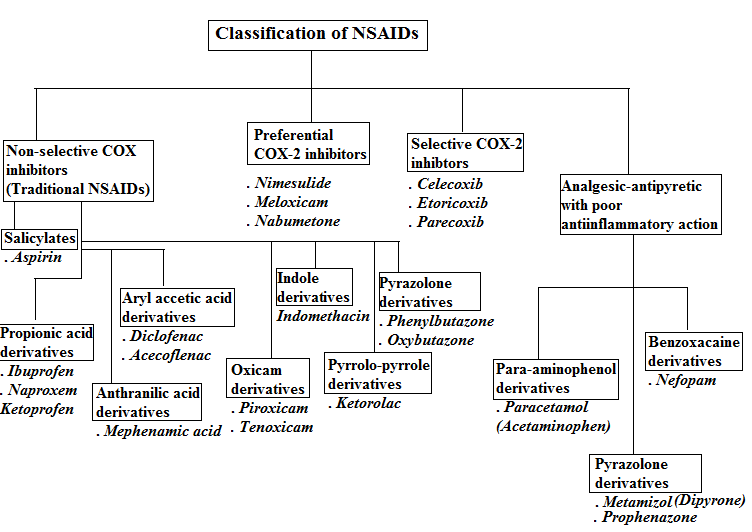 In this article, complete harmacology of NSAIDs along with their chemistry is discussed. Process of Inflammation: Process of inflammation can be summarized as given below. Initial causing release of mediators (histamine, serotonin, leukotrienes, SRS-A, lysosymal enzymes, lymphokines & prostaglandins). Increased vascular permeability & exudation. Leukocyte migration, Chemotaxis & Phagocytosis. Proliferation of connective tissue cells. The most common source of chemical mediators include neutrophills, basophills, mast cells, platelets, macrophages & lymphocytes. Complement proteins are numbered C1 to C9. a) Antibody mediated classical pathway. b) Non-immunological activated alternate pathway. A major function of complement is to mask antigens & microbes with C3 fragments that directs them to cell containing C3 receptors, such as phagocytic cells. Complement activation: Release of IL-1 (cytokine), PGE2 & LTB4. An unknown initiation factor in the synovial joint causes the production of antigenic IgG, which stimulates the synthesis of the rheumatoid factors IgM, IgG, forming immune complexes. IgG aggregates activate complement system leading to the generation of chemotactic factors that attracts polymorphonuclear leukocytes into the cellular cavity. Leukocytes ingest immune complex to become rheumatoid arthritis cells, which discharges hydrolases results in further degradation of joints. All of this induce COX expression. Misoprostol: PGE2 agonists (Inhibits gastric secretions). TXA2 (Synthesized in platelets): Similar to angiotensin II (Vasodilation). LTC4, LTD4 & LTE4: Slow reacting substance of anaphylaxis (SRS-A) (Bronchoconstrictor & Vasoconstriction). COX-1 is constitutive enzyme. Present in resting cells (used for normal functions). COX-2 is inductive enzyme. Produced by cytokines at the time of inflammation. Drugs acting at COX-2 are more selective. NSAIDs do not change the pain induced by direct application of PGs but, block the pain sensitizing mechanism induced by bradykinin, TNFα, IL etc. Therefor more effective in inflammation induced pain. ILs, TNFα & interferrons causes PGE2 production in hypothalmus------> raises temperature threshold. Blocks the pyrogens (COX-2 enzymes). 3. 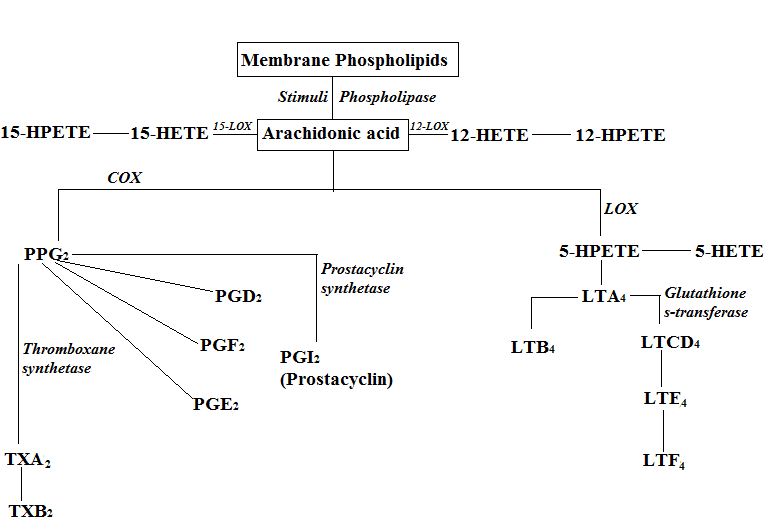 Antiinflammatory: Most important mechanism is inhibition of PGs. TXA2 (COX-1) -----> Platelet aggregation. NSAIDs inhibits both but TXA2 inhibition predominates. Decrease bicarbonate & mucus secretion. COX-1 dependent impairment of renal blood flow & decrease of glomerulation filteration rate-------> Increase renal insufficiency. JGA COX-2 dependent NA+ & water retention. Papillary necrosis on habitual intake. 1. Salicylates (Aspirin): Only NSAID which inhibits COX-1 & COX-2 irreversibly. Active moiety is salicylate ion. Toxicity is due to COOH group (removal of COOH results in analgesic activity only). OH at meta/para results in no activity. Substitution at 5 increases anti-inflammatory activity. Substitution by halogen on ring increase potency & toxicity. Displace following drugs: Oral anticoagulants, Methotrexate & Phenytoin. Inhibits following drugs: Thiazide & Frusemide. 2. Pyrazolones: All cause agranulocytosis. a) Phenylbutazone: Strong anti-inflammatory but rather weak analgesic and antipyretic drug. Not used due to high toxicity. b) Oxyphenbutazone: Metabolite of phenylbutazone but less irritant. c) Dipyrone: Safer & lesser anti-inflammatory but more analgesic drug. a) Indomethacin: Powerful anti-inflammatory (equal to aspirin). Although effective in rheumatoid arthritis but not used due to side effects. Replacement of COOH group with other acidic group decrease activity. Acidity of COOH group is directly proportional to the activity. N-benzoyl derivatives with F, Cl, CF3 at para ------> Most active drugs. At position 5: OCH3, F, N(CH3)2, CH3, COO results in more active than non substituted. N of indole ring is not essential. Alkyl at α postion to COOH is more active than aryl substitution. b) Sulindac: Its a prodrug. a) Piroxicam: Antiinflammatory + Analgesic + Antipyretic. Better tolerated than aspirin. b) Tenoxicam: Same as piroxicam. 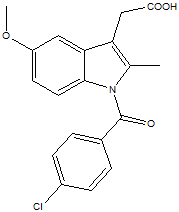 b) Naproxem c) Ketoprofen d) fenoprofen e) Flurbiprofen. Prodrug which is basic in nature. Converted to methoxy napthylacetic acid. 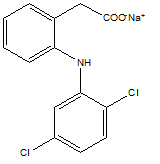 Phenacetin is a prodrug which is metabolized to paracetamol. N-accetyl benzoquinoneimine is the metabolite which is hepatotoxic. N-accetyl cysteine is given for the treatment of hepatotoxicity caused. Paracetamol inhibits the COX of CNS only & not of periphery hence only analgesic in nature & no gastric bleeding. Inhibits the functions of WBC. During inflammation-----> activation of WBC ----> production of cytokines ----> PG synthesis. Nimesulide inhibits the release of cytokine from WBC. If you have any doubt you are free to make a comment below. we will be happy to solve your query. All the best for your preparation. Thanks Sneha for the appreciation.